Do you need some inspiration for your website’s multi-page forms? While multi-page forms are designed to help fight form fatigue and encourage site visitors to finish them, if they aren’t designed to convert, you’ll lose valuable leads and sales. In this article, we’ll show you some great multi-page form examples so you can get inspired and start creating highly converting multi-part forms for your website. Why Use a Multi-Page Form? Before we jump into multi-page form examples, we’ll look at why you should consider breaking long forms into multiple steps. Sometimes in order to get a site visitor to convert, you need to get a lot of information from them. In fact, unlike simple contact forms, you might need much more than just a name and email. However, your site visitor may feel annoyed by a form that asks them too much information all at once. This can lead to form abandonment and low conversion rates. To boost conversion rates on your longer forms, you should create a multi-page form and break your form’s parts up into easier to digest sections. Another good reason to use multi-page forms is to make sure you get higher qualified leads filling out your form. By forcing people to go through multiple steps to convert, you know only those really interested in what you have to offer will finish. After all, it doesn’t matter how many people complete your site’s form if they don’t turn out to be the kind of person you’re looking for. More leads don’t mean more sales. Qualified leads mean more sales. Now let’s take a look at some multi-page form examples that are designed to engage site visitors and get more leads. 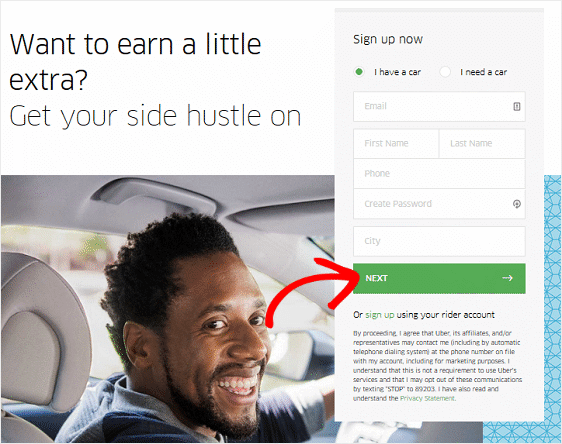 Uber does a good job of guiding people through their long, multi-part form using a variety of strategies. To start, they make the first part of their form easy to fill out. They ask for basic information such as name, email, and phone number. They also include a question about location, personalizing the next step of the form. The call to action button reads Next, making it clear to visitors there are additional steps to the form. Notice the arrow on the call to action button too. This is a nice visual, again making it clear that there are more steps to complete. 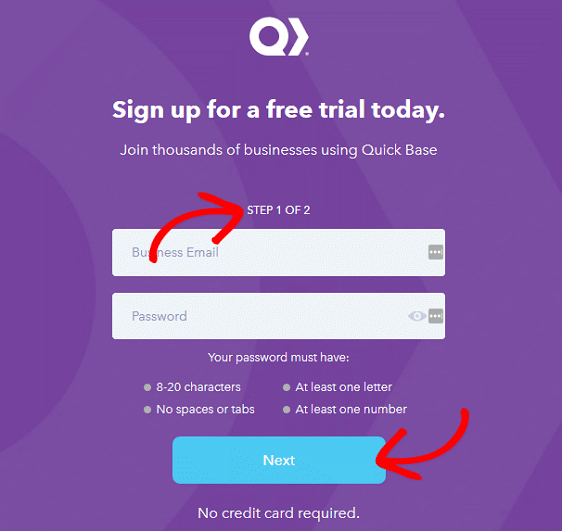 Quick Base takes a unique approach to the multi-step form. To start, they have a bold headline telling the visitor what to expect after converting. They also have a simple call to action button to click. Once a site visitor clicks on the call to action button, the next step of the form appears, which is very simple. It only asks for an email and a password. However, it becomes clear to the converting visitor now that there is one more step to complete the form thanks to the Next button. If the visitor has gotten this far, chances are they’ll finish, especially after creating a password. This means they are a qualified lead interested in the Quick Base free trial. This interest has the potential to turn into a monthly paid subscription in the future. 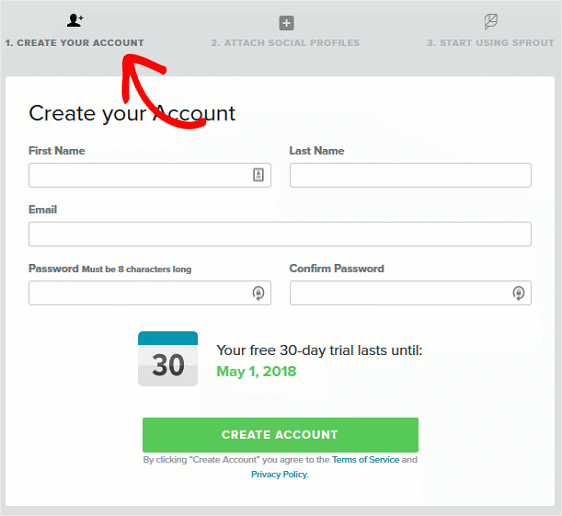 Sprout Social uses the following multi-step form to help people sign up for their free 30-day trial. The great thing about this form is that, much like a checkout page, the steps are outlined above the form so site visitors know there are three steps. In addition, they add descriptions to each step so their visitors know ahead of time what they’ll need to do to sign up. The first step is creating an account, the second step is attaching social profiles, and the last step is where they can finish signing up and begin using the service. If you can get people to create an account, getting them to finish the form is easy. That’s because people love consistency and commitment. 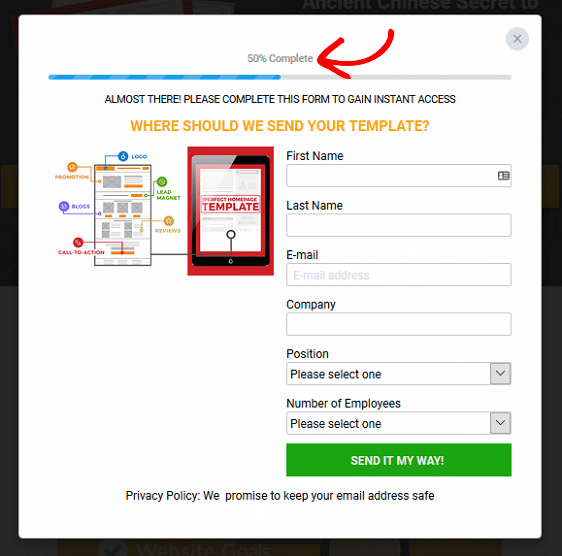 Cirius Marketing combines strategies when it comes to their signup form. To start, they offer a two-step optin landing page, much like the ones you can create using OptinMonster’s fullscreen welcome mat feature. 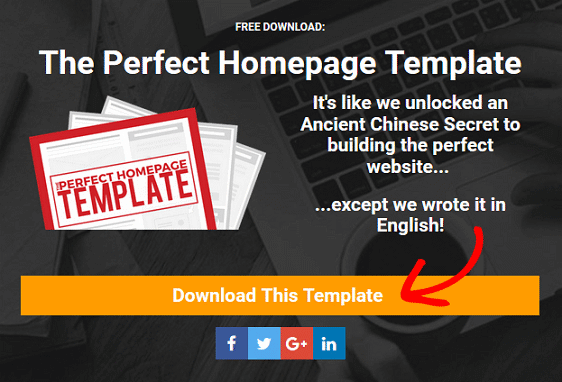 They offer a call to action that can’t be ignored by those who want to download the free homepage template they’re offering site visitors. 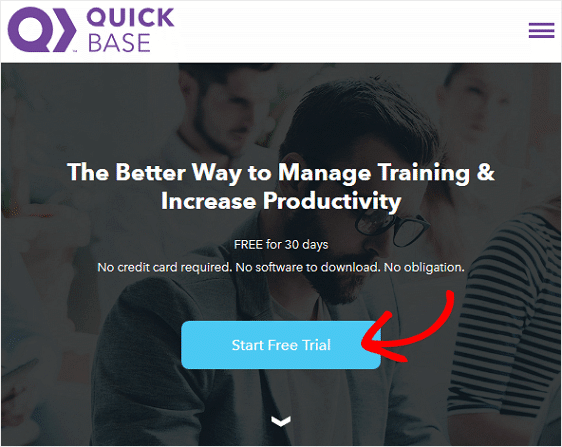 Once you click on the call to action button, you’re taken to a unique popup form showing two steps, thanks to the progress bar at the top of the form. By clicking on the call to action button on the first page, you have already completed step one of two. This form works because it entices leads with the free download incentive, and gets those that are truly interested to give up their personal information for a free download. 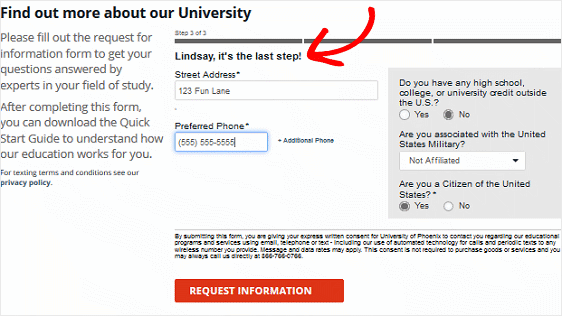 University of Phoenix is great at breaking down their long form into easy to fill out parts. The first step is really easy and non-invasive, putting those on the fence about filling out a long form at ease. 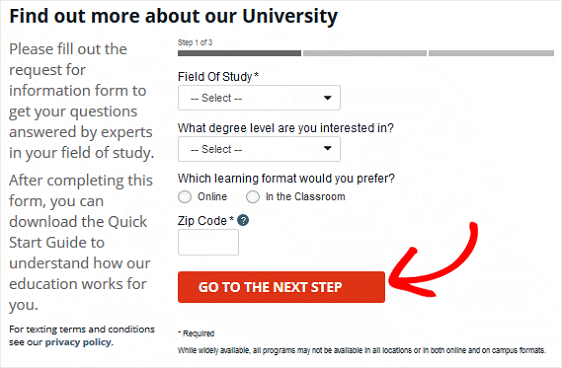 They also make it clear that they’ll be asking for more information thanks to the red Go to the Next Step button. There is also a progress bar showing which step the visitor is on at any time. The next step is also very minimal because it only asks for the visitor’s name and email. Lastly, the form asks for personal information like the visitor’s address and phone number. This is because they figure by now, after having filled out a name and email, any site visitor really interested in learning about their school will also give up their address. This way they can receive the information they want. They also make it clear at the top, in a very personalized way, that this is the last step. This let’s visitors know they are almost done. And there you have it! 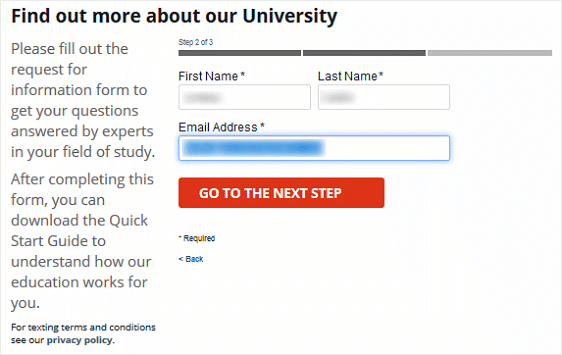 5 examples of multi-page forms that work well to convert site visitors. If you want to learn more ways to boost form conversions, regardless of their length, check out these inspiring uses of conditional logic. And, if you want to make your signup forms even more irresistible, check out these lead magnets you can offer people to increase subscribers.